Workers at the new plant. UAE-based Tech Group has launched its third concrete manufacturing plant in a bid to increase its production base to almost a million units per month. 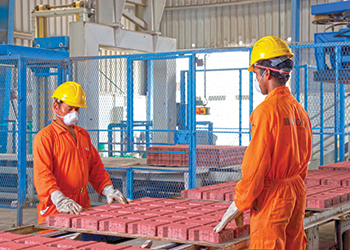 The construction group based in the emirate of Ajman said it has invested close to Dh60 million ($16.5 million) to serve the growing demand for blocks, interlock and other concrete products in the eastern region. Block Tech, the concrete manufacturing arm of Tech Group, is already one of the largest manufacturers and suppliers of concrete products in the Northern Emirates, particularly Ajman and Sharjah. “Our new multimillion-dollar facility will not only cater to the increasing demand, but will also offer us considerable room for expansion of operations in the region and beyond,” he stated. A key member of Tech Group, Block Tech started operations in 2006 and has become one of the fastest growing concrete manufacturers in the UAE. Its product range includes concrete blocks (hollow, thermal and solid blocks) used in walls and support areas and paving blocks for pavements and walkways and driveways. As an ISO 9001:2000 certified company, Block Tech is committed to apply the quality management systems for manufacture and supply of the concrete products, said Hasan. “Our plants located in Ajman are equipped with German state-of-the-art computerised machinery, manufacturing process and techniques,” added Umar. The raw materials for the plant come from Remix Tech, a concrete manufacturer under Tech Group, which is the main supplier of cement and concrete to Block Tech for manufacturing the blocks, interlock and other concrete products. The company is currently supplying to the Ajman Corniche Residence, which is a flagship multi-purpose cluster of seven towers under construction at the Ajman Corniche Road. Block Tech is the sub-contractor and has been tasked with providing Dh7 million ($1.9 million) worth of blocks and other concrete products for the construction of the facility. The types of blocks include thermal and solid concrete blocks as well as interlock, quadro, cube and square paving blocks.